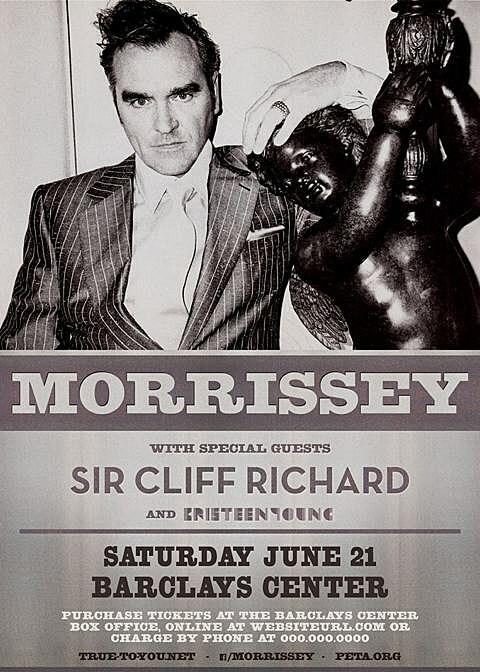 Via True to You, Morrissey has announced two big shows on either coast: May 10 at Los Angeles Sports Arena and June 21 at Brooklyn’s Barclay’s Center. Both shows are with Kristeen Young, and each get a UK pop legend as an opener: LA gets Tom Jones and Barclays gets Cliff Richard (!). Advance tickets are not on sale yet. Stay tuned. Morrissey is currently working on his first solo album for new label home Harvest Records. FACT reports that the entire Smiths catalog is being remastered specifically for iTunes. Poster for the LA Sports Arena show below.